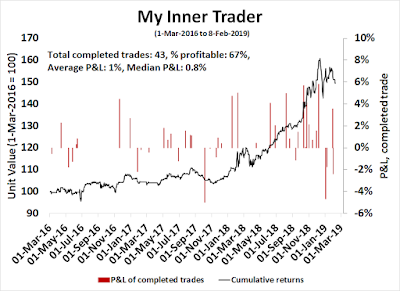 My inner trader uses a trading model, which is a blend of price momentum (is the Trend Model becoming more bullish, or bearish?) and overbought/oversold extremes (don't buy if the trend is overbought, and vice versa). Subscribers receive real-time alerts of model changes, and a hypothetical trading record of the those email alerts are updated weekly here. The hypothetical trading record of the trading model of the real-time alerts that began in March 2016 is shown below. I was recently asked to clarify my market views, as they appear to have been contradictory. Let me make this clear, I am both bullish and bearish, but over different time horizons. I expect that the U.S. equity market should perform well into the end of 2019. The recent Zweig Breadth Thrust signal on January 7 (see A Rare “What’s My Credit Card Limit” Buy Signal) has historically seen higher prices over longer time frames. Exhibitions of powerful price momentum have historically been very bullish. Troy Bombardia recently pointed out that the NYSE McClellan Summation Index (NYSI) recently exceeded 850, and past episodes have resolved bullishly. 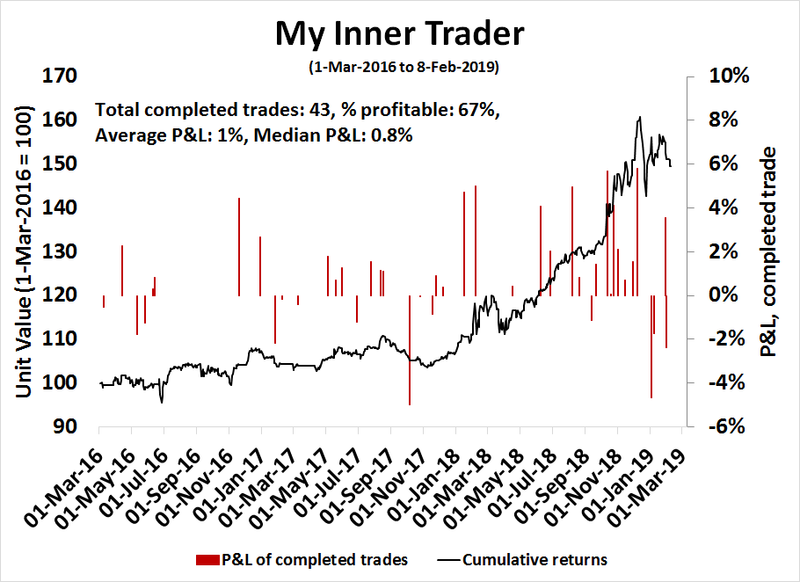 My own shorter-term study shows that the market was higher 75% of the time after one month with an average return of 1.8%, and higher 83.3% of the time after three months with an average return of 3.9%. However, I do have some concerns about the possibility of stock price weakness over the next few months. As we pointed out last week (see Recession Ahead? Fuggedaboutit! ), the market is likely to be spooked by growth slowdown as we approach Q2. Evidence of a growth scare is already emerging. We told you so. We told you the market was going down. Here is the track of Humble Student of the Markets, where we are neither perma-bulls nor perma-bears. Most recently, we have been correctly bullish since the correction of 2015, and turned cautious in August 2018 (see Market top ahead? My inner investor turns cautious, August 5, 2018). We were also timely at the 2009 bottom. We issued a call to buy beaten up low-priced stocks with high insider buying a week before the ultimate bottom (see Phoenix rising? February 24, 2009). The out-of-sample record of our model trading portfolio in 2018 was up 42.9%. For more details, see our weekly updates here. The recent market volatility has brought a flood of new subscribers, and we are announcing a price increase, and a number of other changes in order to better control the growth of our community. However, all subscribers will be grandfathered at their old prices. The annual subscription price will rise from US$249.99 to US$365 per year. The monthly subscription price will rise from US$24.99 to US$36.50 per month. The 24-hour subscription will no longer be offered. The embargo period for free content will change from two weeks to four weeks. Remember, if you subscribe now, you will be grandfathered at the old price - permanently.